Equine Influenza (horse flu) is a highly infectious disease in which the affected animal (horse, donkey, mule or zebra) will have several symptoms including a high fever and a dry cough. a dry, harsh-sounding cough that may linger for several weeks. a clear nasal discharge that may turn green or yellow as secondary infections developed. depression, lethargy, and loss of appetite. there may be swelling in the lower limbs and a horse may be stiff and reluctant to move. Blood tests and nasal swabs are necessary for definitive diagnosis, but consistent clinical signs and close proximity to a confirmed property is often enough. If you suspect your horse has equine flu, stop working him immediately. Continuing to work an affected horse will worsen their respiratory status. The very young and the very old are most vulnerable. Aged horses and foals aged from one to five months can be affected by pneumonia, which can be fatal. Keep sick horses out of bad weather and in the shade. Treatment of equine flu boils down to rest and husbandry. There is no direct means of fighting the virus with drugs, and while anti-influenza compounds are available for use in humans, these have not been used extensively on horses. Fresh air and rest are vital. Avoid dust in the environment, bedding and feed (particularly hay) to minimise the risk of bacterial infections of the lungs and airways. Affected horses should be confined, and walked for short periods to maintain circulation. This should continue for at least the period of the fever and coughing, followed by gradually increasing exercise. The virus damages the respiratory tract, that is the lung tissue and windpipe. Secondary bacterial infection can result. It takes 30 days for repair of this tissue. For equine athletes, a subsequent 30 days is also advised before starting work again. As at August 2007, two vaccines are registered in New Zealand for emergency use. There are currently no plans to vaccinate horses in New Zealand as a precautionary measure. Immune stimulants, containing a bacterial extract (Propionibacterium acnes) may shorten the course of viral respiratory diseases and when administered 2 and 5 days before shipping may lessen the incidence of respiratory disease in transported horses. • A transient swelling (max. diameter 5cm) which regresses within 4 days may appear at the injection site. • Pain and local hyperthermia can occur in rare cases. • A slight increase in temperature (max 1.5C) may occur for one (1) day, exceptionally two (2) days. • In exceptional circumstances, apathy and reduced appetite may be observed the day after vaccination. • In exceptional circumstances a hypersensitivity reaction may occur, which may require appropriate symptomatic treatment. Horses should not be worked hard for at least two days after each dose of vaccine. Article originally published on Horsetalk.co.nz in September, 2007. 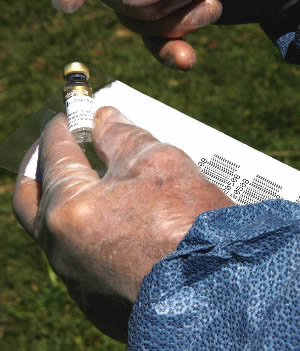 What are the consequences , if any, if you give your older horse a flu shot, while he has a fever ?